"The composition of Schubert's early quartets reflects an intention different from that of his late works: the former were not yet intended for the concert hall but rather for his immediate family. In the early 19th century, the private performance of string quartets was a distinctive feature of musical life in Vienna. As in no other European city, the rising middle class had increasingly taken up the string quartet, which up to that time had been the province of the nobility. The string quartet was practically a fashion accessory, marketed by Vienna's flourishing publishers. From the beginning of the century until the year of Schubert's death, 1828, some 70 composers were represented by more than 400 works, most of them forgotten today. Their primary models were the quartets of Joseph Haydn, but at the same time they also produced more popular compositions. 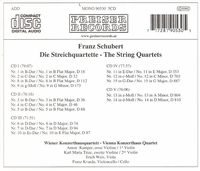 These ranged from quartets that were easy to play and more musically accessible to difficult works in which the part of the first violin required extreme virtuosity. In addition, there were arrangements for quartet of orchestral and opera music, and this was very popular music for playing at home. The music was performed by quartet ensembles that were frequently formed within a single family, as was the case in the house of Schubert. Here we have a remarkable set of beautiful performances."